Handmade in the USA. THE HOG FATHER IS GOING TO BE A HIT! 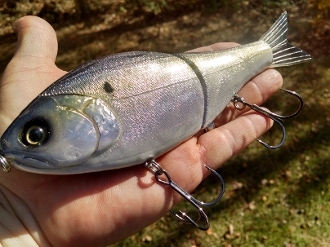 The bait is a perfect match to all Gizzard Shad in most bodies of water. We are currently taking Black Friday preorders now. Order yours now and get on the list. Baits will be shipped as soon as possible and I will work from the list in a first come first serve basis. SPECS Length 8 1/2 inches flexible tail fin weight 4 oz. Slow Sink. Question feel free to PM me on Facebook and Like us at the TATER HOG CUSTOM LURES PAGE.